The Washington Nationals radio network is a United States radio network airing Washington Nationals baseball games in the mid-Atlantic region of the United States. 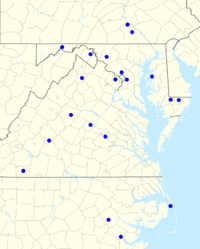 The Washington Nationals Radio Network consists of 14 stations 11 (AM, 3 FM) as well as 2 FM translators and 3 FM HD subchannels. The flagship is WJFK-FM/106.7. The Nationals' broadcast team consists of play-by-play announcer Charlie Slowes & color announcer Dave Jageler. Additionally, Byron Kerr hosts "Nats Insider" & Phil Wood hosts "Nats Talk Live". WFED/1500 (also on HD Radio) (Class A station providing extended coverage at night on the eastern seaboard). ↑ Radio affiliates' page on the Nationals site.